Lake Bled doesn’t freeze very often but this year the temperature was very low for almost all January and it was finally possible to walk all the way to the island. First, only a few of the bravest men and women dared to walk more than a few meters from the shore, but after the lake was completely covered with thick layer of ice, whole masses migrated to the island. And it’s really an amazing sight to see. It’s a phenomenon that as a photographer you really mustn’t miss. Last time the lake was frozen like that was back in 2012. Winter at Lake Bled can be very beautiful without icy lake (one morning last year was spectacular), but ice sure makes it more fun. One day a low fog crawled in just after the sunrise and made the atmosphere even more spectacular and special. I decided to make the images black and white as they are more dramatic this way. All the images were taken on 29th January 2017. Local hill Osojnica offers great views over the lake and the island. First visitors (mostly fellow photographers) came to the island very early. This image was taken just after the sunrise. He’s probably wondering if the ice is thick enough? Don’t let the cracks and smooth spots scare you. The ice was very thick and safe to walk on. At this time the fog just started to roll in. Some skaters who also played a game of hockey later on. Winter in black white can look very special. Swans are very common at Bled, so they aren’t afraid of people at all. Wall of fog was getting closer and created a surreal atmosphere with only the castle peeking out of the fog. Close-up of Bled castle with Mount Begunjščica above it. Another look back to the church on the island. A little bit of minimalism. This scene reminds me a bit of the north scenes from Game of Thrones. Looks like white walkers coming out from the fog in an icy environment. This one is even more dramatic. Just perfect alignment of the mass of people walking towards the island and mountains and Bled Castle in the background. Viewpoint above the lake with a coffee and pastries shop beside it. Some people came to the island with a motorcycle. 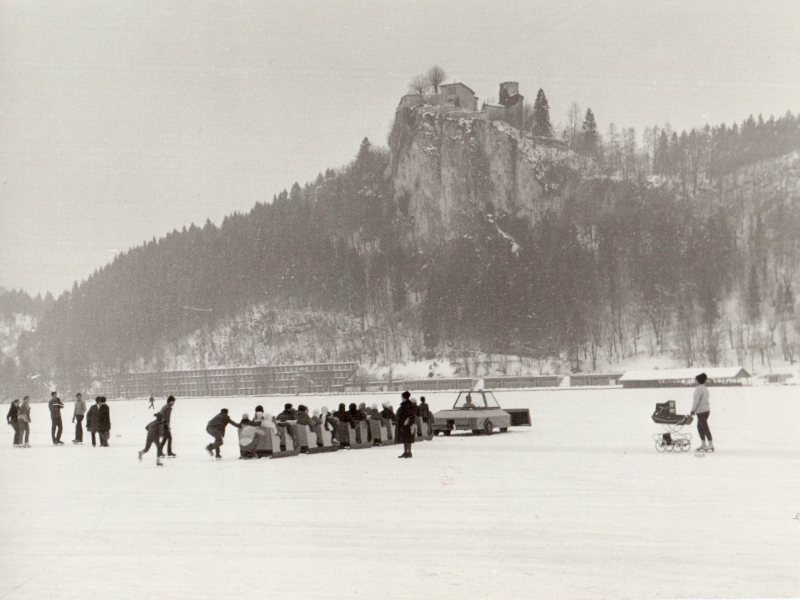 I remember from when I was a kid (about 25 years ago) the ice got so thick that some people even drove their cars on the lake. And back in 50’s there were motorcycle competitions on the lake. This is the only old image I found from back in the days when the lake was frozen almost every year since winter were much harsher. I really hope the lake freezes again as soon as possible as I had a lot of fun photographing it.